A high spec, shock-absorbing webbing dog lead that actually works! 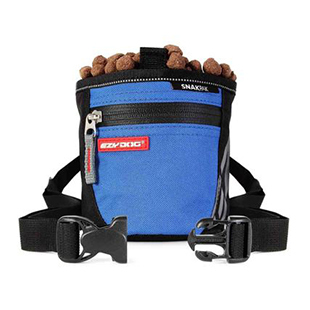 A 6' leash with a highly sprung bungee system that absorbs any sudden shocks made by your dog. It is soft, durable, reflective and will not lose its tension over time. The Zero Shock Bungee Cord Leashes combine the ultimate comfort, control and protection, while not compromising on style and quality! 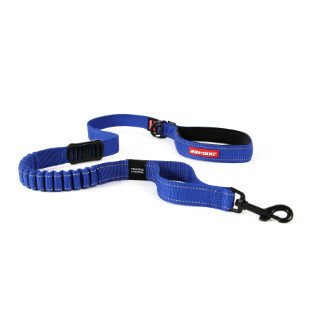 This version of the Zero Shock Leash is made from narrow .5" webbing, meaning that it is lighter in weight than the standard versions. It is the perfect leash for dogs 26 lbs and under. Zero Shock™ Technology is the advanced shock absorbing component in the center of the leash that cushions and eases the pressure for both the owner and the dog. Our own blend of super soft, double density nylon makes this leash for small dogs a pleasure to hold. We then finish it out with reflective trim for night time safety and an additional neoprene lining in the handle. My wife and I were both incredibly disappointed with this product. We bought two of them for our pair of Jack Russell mixes to replace the old EzyDog Mutley Dog Leashes that we are now still using because these new leads were totally worthless. The hand loop was far too big (I wear men's medium gloves) for either of us to secure over our wrists. Every time one of our dogs pulled on the leash (which is always with a JRT) we almost lost them. We also didn't like the material that the neoprene loop is covered with because it was hard to grip. Our EzyDog Mutley leads had neoprene handles that felt more like Neoprene. Also, 72 inches is too long for us and there were no other lengths available. I really liked the length of the EzyDog Mutley (40 inches) and used with an EzyDog extension (24 inches) it gave us a five-foot-lead which works much better for a small dog than a six-foot-lead. The shock absorbing quality of the lead was okay, but again, we preferred our old EzyDog Mutley leads which didn't seem to have as much "give" making it easier to control "spirited" dogs (I did mention that they're Jack Russell mixes?). Anyway, if you're a fan of the old EzyDog Mutley shock absorbing leash, I suspect you may not like this leash at all. My wife and I certainly didn't. It’s made with quality materials and looks nice. I love these zero shock leashes! I have purchase a few of them and have gave them as gifts. This leash pulls my dog gently back toward me without giving her a whiplash. I haven't seen any of these leashes in the local stores. It's a gentle way of reminding my fur kid that I'm in control for our walk. My dog is not a puller and it works great! However, I'm not sure about the dogs who likes to pull. Love the soft loop handle! The padded soft handle on this leash is great. If this handle was on the vario 4 or vario 6 they would be perfect. I find this leash too flexible for my puppy in leash training but it is great for anytime you want to let them lead you and pull you.